I am a sucker for spinach and artichoke anything! Pizzas (obviously..), dips, pinwheels, you name it! So I wanted to incorporate it into a high-protein chicken dish. I originally was just going to make a spinach and artichoke covered chicken, but I thought a pasta element would be perfect! 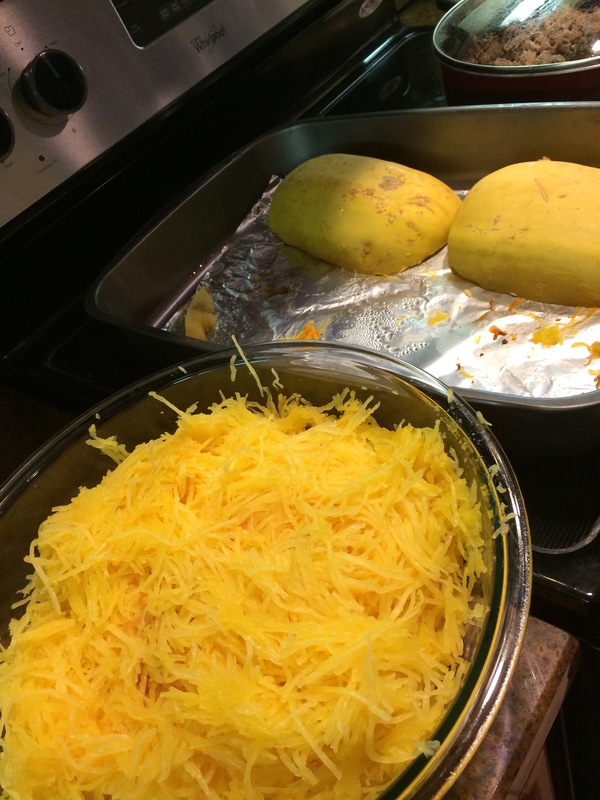 Thus, the idea for spaghetti squash was born. First, in order to be able to prepare this dish you must cook the spaghetti squash. I pierce the squash with a fork multiple times, place on a microwavable friendly plate, and microwave on high for 8-10 minutes. While that is in the microwave, preheat the oven to 350F. I allow that the squash to cool. Once cooled, I cut the squash in half length-wise. Remove the seeds from center of the squash. Place the squash cut sides down on a cookie sheet or baking pan lined with tin foil. Bake for 30-40 minutes. Allow to cool. You can then scrap the insides of the squash–this will come out in strands, this is what you will be using as the “pasta” portion of the dish. While the spaghetti squash was cooking, I cooked a large package of chicken as well, just seasoned with a little salt and pepper. Cooked until internal temp of 165F, about 25 minutes. 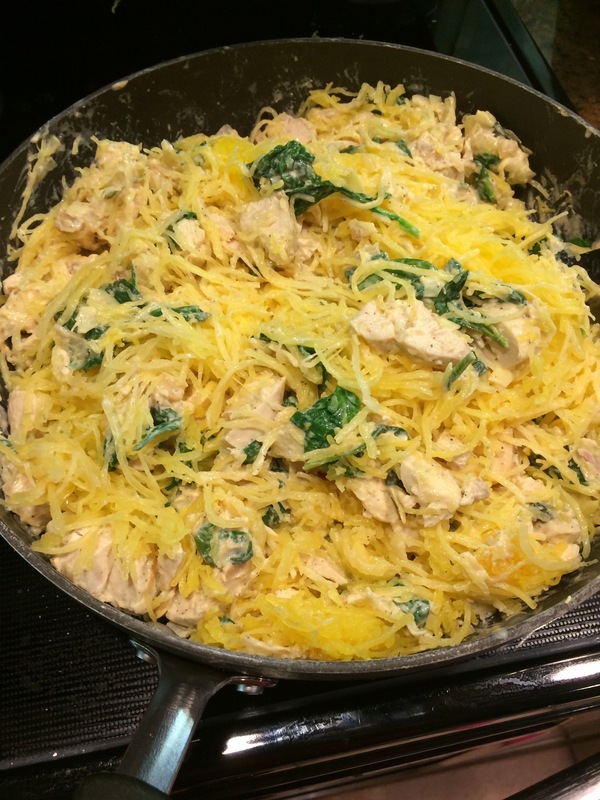 Spaghetti Squash (I used 860 grams total– This was about 1 1/2 baked spaghetti Squash) — Feel free to use 1 total squash to save yourself from having to prepare two, but the macros will be a little different. When the Parmesan cheese is fully melted I added in the artichoke hearts and spinach. Cook until the spinach is wilted. Add in the cubed chicken breast to the mixture. Give a good stir to fully incorporate. 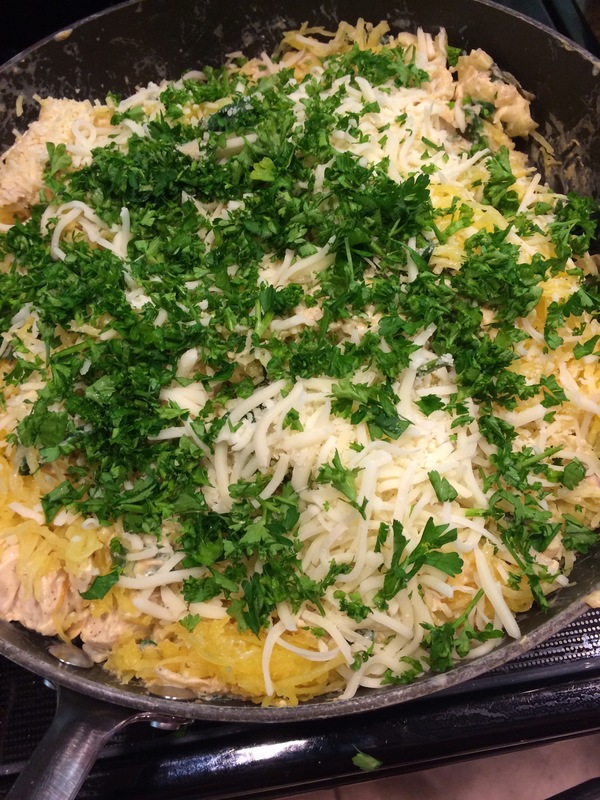 Lastly, add in your cooked spaghetti squash, remaining 1/4 cup of Parmesan, 1/2 cup mozzarella, salt, pepper, and the chopped fresh parsley. Mix well. I used kitchen tongs to help mix– it will be a large portion. I divided this dish into 6 portions– 350 grams per portion, so they were a good healthy portion each. 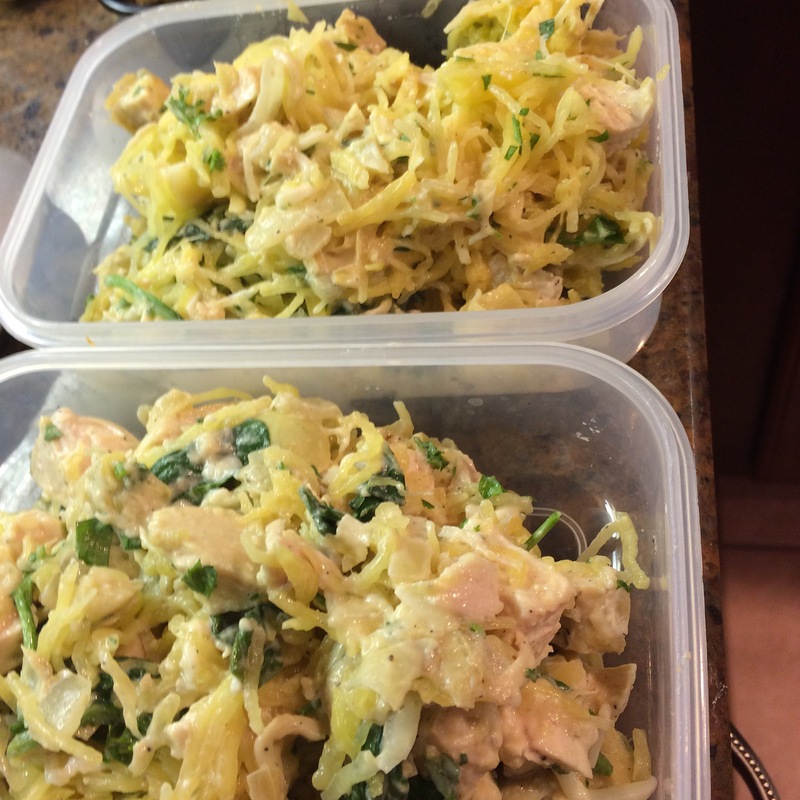 I prepared them in tupperware containers to meal prep for this week. As you can see, there are many health benefits for choosing spaghetti squash over pasta in your favorite dishes. I hope you and your family enjoy this recipe! This sounds wonderful! I’ve never actually made spaghetti squash before. I keep meaning to but never getting around it. This one might change that! This looks great! I love Spinach Artichoke everything too, so can’t wait! 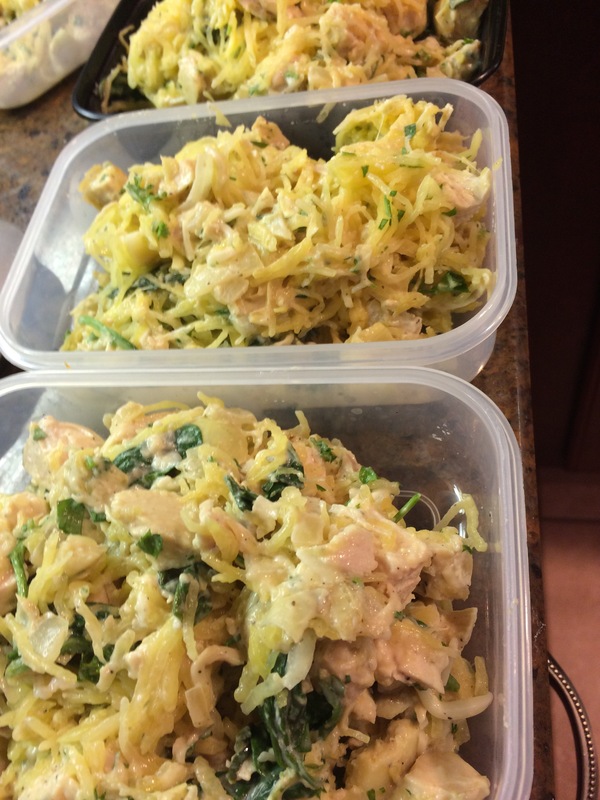 I have made spagetti squash for my meal prep before and love it every time! I will definately try this recipe out since it is pretty well rounded with the protein and the veg. Thanks! Thank you for this recipe, it turned out great and was very yummy! 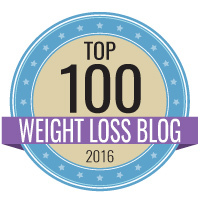 We are so happy we found a great tasting, healthy meal!